Masala cauliflower – a quick and easy way to make a spiced cauliflower, to be the centerpiece of a simple weeknight meal. 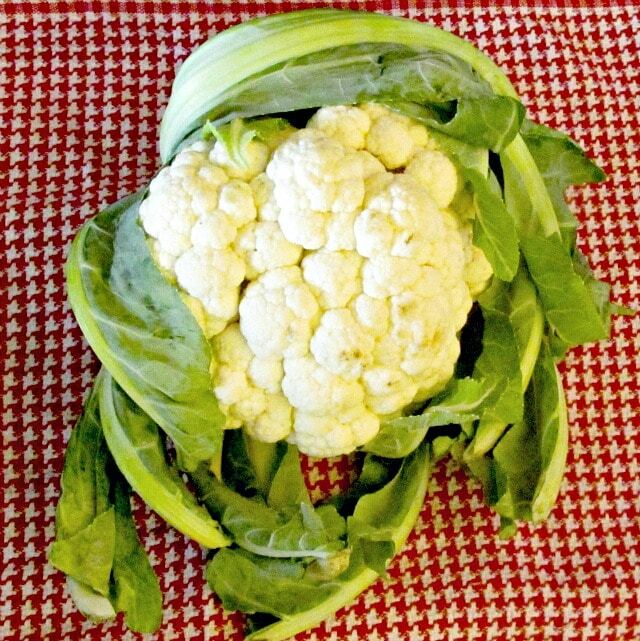 Look around food blogs, talk to friends, watch TV cooking shows – cauliflower is the workhorse, carefully hidden, or dressed as something else. It’s considered hardworking and virtuous, but not a food you’d really invite to dinner… so you carefully cover it up. I’ve seen it mashed, pretending to be a potato, grated and pretending to be rice, or pureed and pretending to be a cream sauce. A standby or stunt double, perhaps – good enough for the distance shots, but not the close up. Which mystifies me, as I see it as a star! I try to avoid the Good Food/Evil Food dichotomy for many reasons. And one is that so much I read seems to suggest that here is a Virtuous Recipe – which obviously you would never even consider eating if you didn’t feel Virtuous… and here is the Evil Recipe that you would eat all the time if you thought you could get away with it. And that just isn’t the way I see food. I don’t eat vegetables because they are “good for me” – though it’s nice that they do seem to be – I eat them because I love the taste and variety! 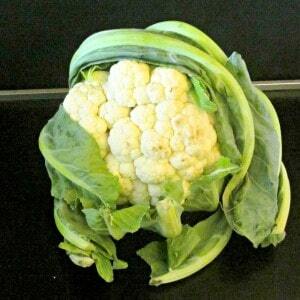 So – cauliflower. Look at it – isn’t it beautiful? A classic presentation is a single whole steamed head (best done with a small head so you don’t overcook the outside before the center is tender…) I usually separate it into florets first, and just cook what we will eat at once, then eat it plain – I love it just steamed crisp tender, with maybe a touch of butter… But, to continue the Star analogy, you can give it the evening gown, so to speak, of a luscious cheese sauce. Indeed, a very traditional British dish is Cauliflower Cheese – cauliflower baked in a cheese sauce. 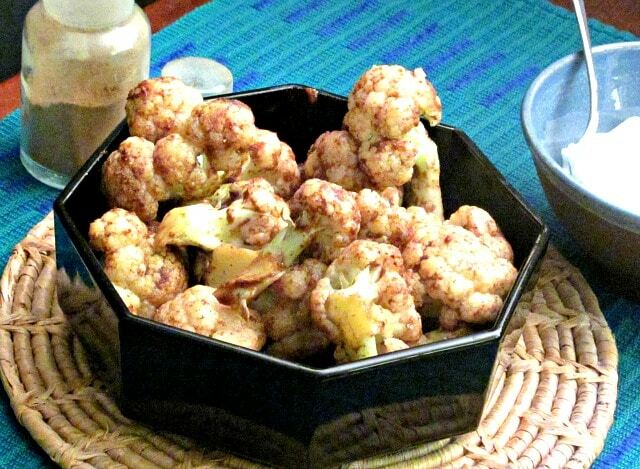 Many Indian dishes are based around cauliflower, too. And that inspired this recipe… If you want a proper cauliflower curry, find a recipe on the many Indian blogs, and you will have a wonderful dish worthy of being the centerpiece of any festive meal. But here, I’m just going faster, simpler, Authentic New York, all my usual… Something I can throw together for a quick and easy dinner, that still holds interest. A vegetable dish that can make a meal with a plain steamed fish filet or chicken breast… or just a bowl of dal with rice. As you may know, Indian cooks do not use what we call curry powder (though you can use that in this recipe…) They do, however, use a variety of spice blends, called masala, for all the reasons other cooks all over the world do – blending spice mixtures in bulk allows a more complex blend, and having a jar of the stuff is convenient. One of the most common blends is garam masala, used in many dishes – more flavor than heat. I always have some on hand, from a local Indian store, and sometimes use it in American recipes calling for curry powder, as well as Indian recipes that actually call for it. And it seemed to me that it would be a good, fast, and easy way to add flavor to cauliflower on a day when I didn’t want to make a real curry. I needed a quick and simple meal. So I just took the head of cauliflower, cut up florets, and washed them. Then I heated oil in a saute pan (that has a lid – important!) and stirred in some garam masala, to blend and heat it. The amount you use will, as always, depend both on your taste and on the strength of your spice mix – they do vary. I’d try one teaspoon to begin with, for the two cups of cauliflower I cooked. (I actually added a bit more, but we like spice.) Once the masala was distributed in the oil, the cauliflower went in, and I stirred it well to coat it with the spiced oil. Then I added 2 cubes of frozen chicken broth… If you don’t keep broth handy in ice cubes, make that a quarter of a cup – and it can be vegetable broth or water, instead of chicken broth, if you prefer. The key is, just a little liquid in the hot pan to create steam – then quickly cover the pan and lower the heat under it. 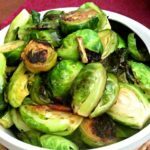 I steamed it five minutes, as we like tender crisp and I’d cut small florets – you can cook it up to ten, if you prefer the vegetable softer, or have larger pieces. Then serve. I served it with a dollop of Greek yogurt, reminiscent of raita, but that’s optional. Some of the spice mix remained in the pan – if you want, you could stir in a touch more broth, or even a little butter, and pour it over that plain fish or rice I mentioned. This is also a great way to give a little life to frozen cauliflower, if you have that… Skip the broth and just cover the pan as soon as the vegetable is coated in oil – there is always enough moisture in the frozen pieces. And heat until just heated through, since it is already lightly cooked. And there you are. Super easy ( to the point of mindless) but good – cauliflower as a star on your weekday table! Masala cauliflower - a quick and easy way to make a spiced cauliflower, to be the centerpiece of a simple weeknight meal. 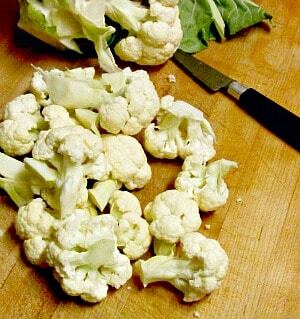 Trim and wash the cauliflower. Heat oil in a saute pan that has a lid. Add the garam masala, and stir to blend well, and then heat the spice a moment to release flavor. 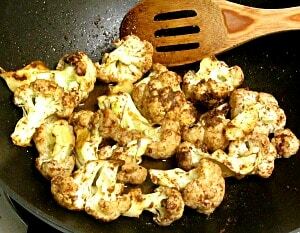 Add cauliflower to the pan, and stir well to coat with the spice mixture. Add broth or water, and immediately cover the pan. Lower the heat under it, and cook, covered for five minutes. Check to see if it is done to your taste, if not, give it a few minutes more. Serve at once. A dollop of Greek yogurt on the side adds a note of creamy luxury.